Wondering why you have so many scorpions? Then it’s time to take a look around and get started with scorpion control! Landscaping may be a big part of scorpion problems! Scorpions LOVE to shelter under large landscaping rocks. 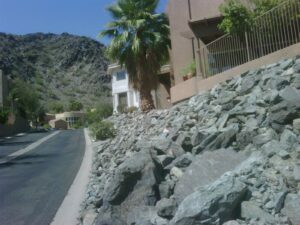 If you live near an area with lots of large landscaping rocks, you are close to scorpion heaven. Scorpions also like to infest cracks and crevices in rocked walls and concrete and concrete block wall fences. This picture shows one of its pest harboring areas. Why do we have scorpions? Scorpions LOVE areas with lots of places to hide, hunt, and stay warm. ROCK beds, especially LARGE rocks, provide the perfect place to THRIVE. Not only is it hot, but there’s plenty of places to hide & food to hunt. Many neighborhoods throughout the Phoenix Valley have rocked drainage or landscaping areas with bigger rocks. Rocked drainage and landscaping areas are a hot spot for scorpions, and neighboring homes reap the scorpion pressure. Scorpions also LOVE rocks on homes. Rocked walls give scorpions plenty of cool cracks and crevices to shelter inside. Another scorpion hot spot is concrete block wall fences. Block wall fences not only have cool cracks and crevices, they also have interior voids especially around the “I” beams (joining beams) between sections. Left untreated, a small scorpion problem grows into a big infestation! Scorpions attract other scorpions to mate or nest together using pheromones and vibrations. Scorpions also give birth to a large brood of babies making problems bigger. The more scorpions and sheltering areas around a home the more scorpions they’ll have. Control scorpions NOW and prevent future infestations with the scorpion control specialists at Responsible Pest Control! So many Phoenix Valley residents have been told that you can’t kill or get rid of Arizona Bark Scorpions. Our professional exterminators have spent hours collecting scorpions to use for product testing. We’ve tested the best professional products on different surfaces for best scorpion control results. Not all scorpion control products work the same, and some work better than others. Certain products give great scorpion control on one surface, but not on another. Scorpion pest control test results allow us to provide Scorpion Control applications that really works. We recommend monthly maintenance service for optimum Arizona scorpion control. Many residents have the misconception that scorpion go away during the winter, but this is not the case. Arizona scorpions and Bark Scorpions live all year long. They are very resilient, and can survive the coldest temperatures our desert may have. Most scorpions are solitary, but in the winter Bark Scorpions will gather in groups of 20 to 30… You may not see them, but they’re there like a scorpion bomb that will explode come spring. No one wants that in their home or yard! To get the most effective scorpion control, you need to have regular pest control services year round to keep them out of your home and yard. Scorpions need food, water, and shelter to live and breed. They hide during the heat of the day under tree bark, rocks, concrete, or debris. Scorpions need humidity, which is usually provided by watering systems, for themselves and their prey. Scorpions are commonly found in homes, and only need a 1/16 inch opening to enter your home. The more we remove these scorpion resources from our environment, the better scorpion control results we will achieve. Delivering GUARANTEED Scorpion Control in Phoenix, Mesa, Tempe, Gilbert, Scottsdale, Chandler, Queen Creek, Maricopa, Glendale, & ALL surrounding areas.